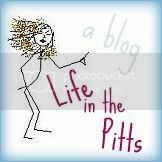 Life in the Pitts: Pregnancy is magical. And miserable. I have a friend currently experiencing something similar... thank god it doesn't last tgrough the entire pregnancy, right? Thank god for the kindness of some strangers and the self-absorption of others. Oh sad. I'm glad you didn't get sick in the store! I think it's important to check with a dietitian what proper food group should one take when she's pregnant. A pregnant may have some sugar substitutes during pregnancy if she can't avoid too much sweets.